Korea’s best hope Lee YD/Yoo YS lost their dream to create hat-trick of titles by losing yesterday to Li JH/ Liu TC. Bad fortune for Indonesia camp in this Premier event, following Ahmad/Natsir shock defeat at first round of the mixed doubles, another Indonesian best hope pair of Ahsan/Setiawan continued their negative trend of results, this time stunned by home back up pair Wang Yilu/Zhang Wen. As expected two big matches in MS category will draw a huge amount of attention this evening, Viktor Axelsen will challenge home favourite, world champion and number 1 seed Chen Long and second seed Jan O Jorgensen has former world number one Lee Chong Wei. Axelsen had a tough battle to clear two Hong Kong players, Wei Nan and Vincent Wong at previous rounds while Chen L breezed past his early rounds opponent. The Danish hotshot has troubled the world champion in their last three meetings coming very close to beating Chen L last month at the Danish Open. Lee CW was forced to play a third game by Chou TC and still favourite to overcome Jorgensen. Badminton’s living legend, Lin Dan, will be up against the resilient Hu Yun and one remaining quarterfinal tie will pit Korean #1 Son WH against the qualifier and promising talent, 19 year old Shi Yuqi who stunned two familiar names, Tago and Lee DK en route to his first ever last eight spot in top tier tournament. For the women’s singles, all top contenders sailed into quarters, defending champion Saina Nehwal displayed sluggish performance but still edges out Tee JY will face solid-defensed Japanese WS, Nozomi Okuhara. Wang Shixian has the toughest hurdle in facing none other but the remarkable Carolina Marin. On paper scenario, Li Xuerui has better chance to secure semifinal spot than her two compatriots. 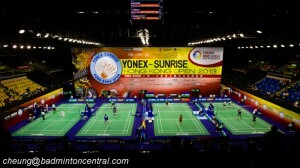 The unexpected result surged Men’s Doubles department when top two seeds were sent packing at same stage by local boys. Former World Junior Champions, Li JH/Liu YC stopped Lee YD/Yoo YS winning streak while their teammates Wang YL/Zhang W stunned reigning world champions Ahsan/Setiawan earlier in the tournament. These two giant-killers will meet other elite pairs in last eight: Wang YL/Zhang W against Japan top-ranked Endo/Hayakawa and Li JH/Liu YC against former world champion Ko SH/Shin BC, in a rematch of KOR GP Gold semifinal last week. Last year beaten finalist, Chai B/Hong W will up against Hashimoto/Hirata and former champions Boe/Mogensen contend with Kim GJ/Kim SR in the hunt for semifinal berths. Chinese WD has secured final ticket as their four pairs rule the bottom half of draw and will face each other at quarterfinal round, Huang DP/Ou DN v Tang YT/Yu Y and Tian Q/Zhao YL v Luo twin sisters. At upper-half draw, top seed Matsutomo/Takahashi has recent SEA Games gold medalist, Anscelly/Soong FC who surprised one of current Korean leading WD, Jung KE/Shin SC. European finest, Pedersen/Juhl will be tested by Chang YN/Lee SH. Four Chinese pairs in XD quarterfinal, two local leading combinations Zhang N/Zhao YL and Xu C/Ma J have the upperhand against Jordan/Susanto and Nohr/Thygesen who eliminated their more fancied opponent at second round, Ko SH/Kim HN and Lu K/Huang YQ respectively. At lower half of draw, current Japan SS winner Fischer/Pedersen will take on local qualifier Liu YC/Ou DN and fourth seed Liu C/Bao YX have English couple Adcock/Adcock to eye semifinal spot; the latter should be close contest.